Run. Write. Mom. : You're Going to Run How Far? You're Going to Run How Far? I am so so tired this morning. I was supposed to run 5 miles. I got up a few minutes after my 5am alarm, brushed my teeth, stared at my running clothes for a minute and went back to bed. Any tips on getting an 18 month old to sleep? Ugh. Anyway, if I'm going to do a marathon (I am!) I can't miss runs. I'm still going to get today's done, I just know it's going to be a lot harder to fit into the day, that's why I run in the morning. Less things to sidetrack or discourage me. However, as it gets colder, getting out the door before the sun comes up gets harder and harder. Me at the start of my first half marathon. I was nervous. Today, I wanted to talk a little about my decision to run a marathon and how I chose the race I did. It really wasn't long ago at all (I'm talking weeks, not months) when I said that I had no desire to run for that amount of time any time soon. Next thing you know I'm registered for a full 26.2. There's several factors I can blame for how this happened. First, there's my desire to one day run an ultra. I know it sounds silly, but I've kind of considered the marathon distance a little boring, I don't know how to better explain that. It's so typical I guess. I mean I like the half marathon distance, it's simple enough that a weekend warrior can crank one out regularly, yet it's still enough to be a challenge. The full takes much more dedication and is what many of those weekend warrior say they'll do "someday, when I have more time" or what their friends try to talk them into. An ultra is different though, it's something most runners think they will never do and most non-runners have never even heard of. 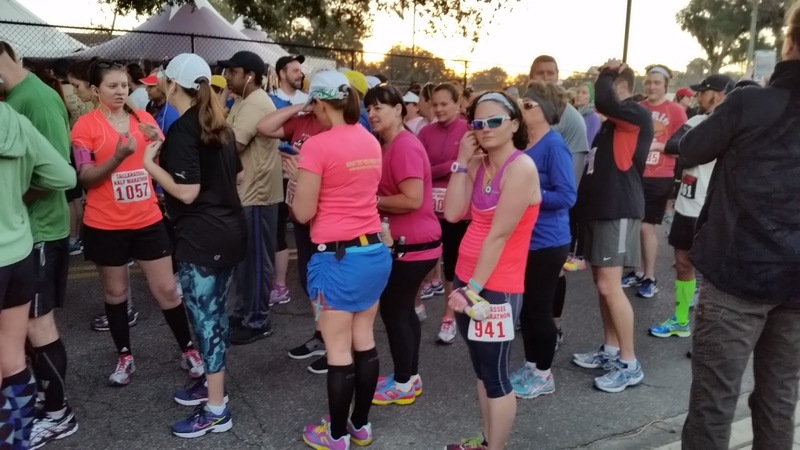 It's something, that even among regular runners, elicits the wow factor. It's a serious personal challenge. My interest in ultra running caused me to recently read several books on the subject like Eat and Run and Finding Ultra (which is really more about triathlons). Reading these books furthered my interest, but the possibility of running and ultra still seems so far away for me. Not because of physical ability, but because I'm a stay at home mom to 3 kids under 5. So, a marathon is more doable at this point and the next logical step from where I'm at. That's not what put me over the edge though. There's two more things that had a big influence. One was getting a new V02 max number from my Garmin Forerunner 620. I know these numbers from a watch should usually be taken with a grain of salt, as they are just estimates, but I've seen a lot a people who've had the race predictor give them numbers that come very close to their actual race times. In fact, the first set of numbers the Forerunner gave me were remarkably close to my PRs for the 5k, 10k, and half marathon. So, I take the new numbers in the race predictor as being somewhat attainable for me, at the least as a best case scenario. I'm not a fast runner, so marathon training seemed so time consuming at this point in my life, but when my Garmin estimated that I could run a marathon in just over 4 hours, I thought, "hey, that's not so bad." Then you have the race, the race itself is what put me over the edge. Like a lot of runners, I am often checking race schedules to see what nearby races I might want to enter. I had noticed the Snickers Albany Marathon and Half a while back, because of course, Snickers caught my attention. I thought I might want to do the half there since I don't like the new course for the Tallahassee Marathon and Half. That was just a distant thought at the time, it's not until March anyway. Then, weeks later, I heard some ladies from the MRTT group I run with talking about the same race. When I got home I looked it up again, still thinking about the half, but then wondered about the full. Since I'm already in the middle of a training plan for a half in January, I wondered how the timeline would workout to get from a half to a full between the first weekend of January and the first weekend of March (9 weeks). I consulted my friend Hal Higdon on this subject and discovered that his "Novice 2" Marathon plan has exactly 9 weeks between a half and a full! I took that as a sign. It's like I'm getting a 2 for 1 deal with the training plans. I'm not spending quite so long on a full marathon training plan because I'll already be halfway there. It just made sense to go ahead and do it if I was going to do it. Now to find an ultra plan that lines up with an ultra the right number of weeks after my marathon. Just kidding...for now. Yeah, training for a marathon is time consuming for sure. Some days you are feeling on top of the world, other days, meh. You will do awesome though as long as you get in the training. I think the time commitment might be the hardest part, (maybe not once mile 17 comes along). Best of luck. Yeah, I kind of feel like the only friends I'll have left are running friends. What an inspiration, 3 under 5 is crazy. My wife and I have one 15 month old and its all that we can handle. Thanks! That's such a great age. Don't get overly aggressive with the duo marathon target time. Worth the low mileage of Higdons novice plans you'll want to ruin significantly slower than the prediction. I've run 4 marathons, and still struggle worth going out too fast and bonking hard at mile 21..
Good God I hate Skype somedays, hopefully you can make that out. ..